Spain’s most diverse and fascinating region, Catalunya is chiefly familiar to millions of visitors by virtue of its proud capital, Barcelona. Indeed, there probably isn’t anyone who hasn’t heard of Spain’s bustling Mediterranean metropolis, home to Gaudi, Las Ramblas, and a superlative range of hotels, restaurants and wine bars. Its charms continue to seduce many, however, despite the renown of that great city, rural Catalunya remains largely unexplored by visitors. This is a crying shame, for Catalunya is a truly astounding place, full of medieval hamlets and villages that have been unchanged for centuries. 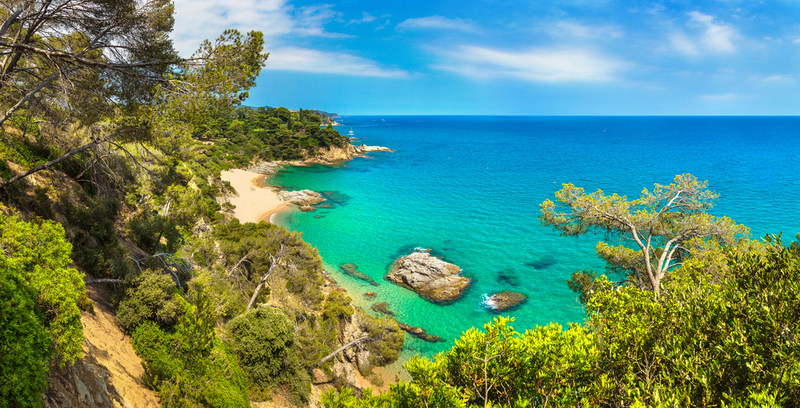 And in a region where you can get pretty much anywhere within six hours travel, you can pass from sandy beaches in the south to coves hidden away among the bluffs of the rugged Costa Brava. Or, head into the interior and explore the remote and majestic peaks of the Catalan Pyrenees. Diversity really is the name of the game in Catalunya. 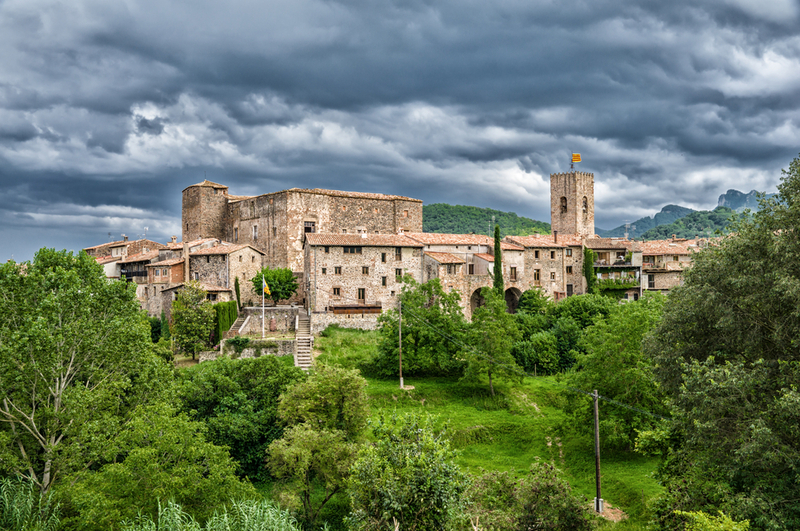 One of Catalunya’s most picturesque villages, Besalu is a must visit destination of northern Catalunya. 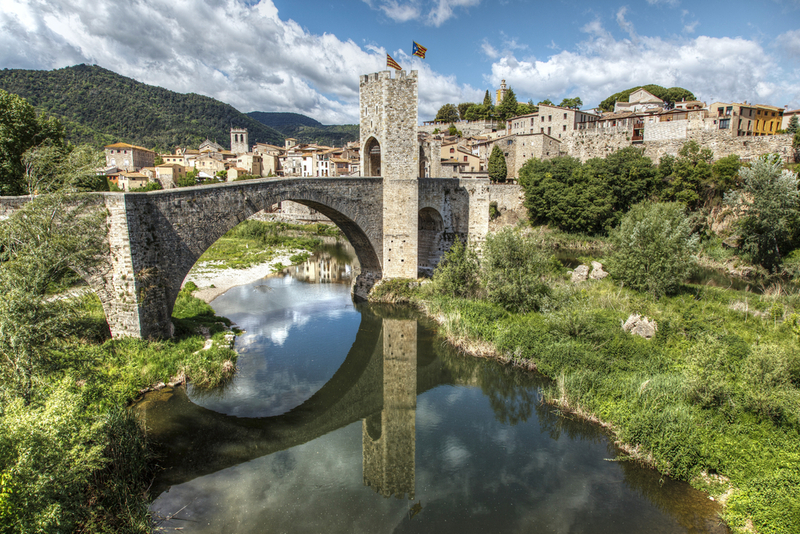 Located inland from the dramatic Costa Brava coastline, Besalu was the capital in the 10th and 11th centuries of an independent county that stretched as far west as the town of Cerdanya, before it came under Barcelona’s control in 1111 AD. It boasts an incredible legacy of Jewish and Catholic heritage – including 3 Romanesque churches – two communities that lived together in peace until the Jews were expelled in 1492. Most beautiful of all is the amazing view of the village across the crooked, 11th century fortified bridge that crosses the “Fluvia” river. 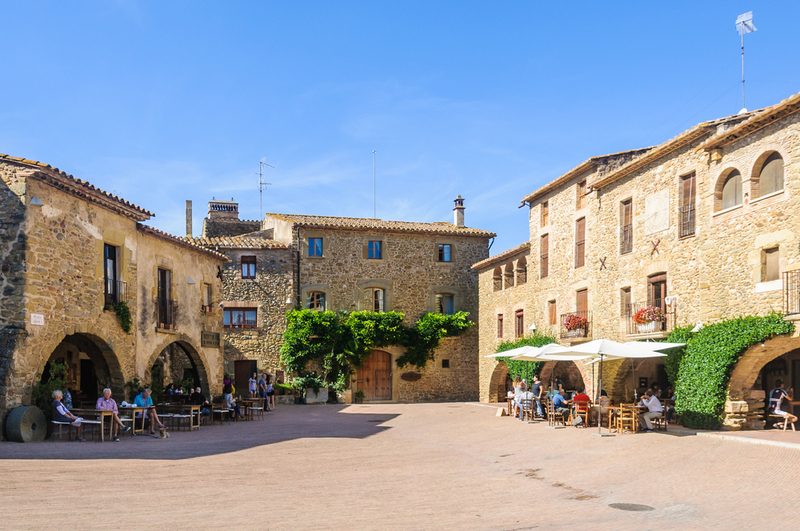 The Placa de la Llibertat has some lovely cafes with outdoor terraces – our favorite restaurant is Can Quei, where you can enjoy local delicacies like Fideau (pasta in squid ink) and drink a glass of Emporda, the nearest wine region to Besalu. No more than a sleepy hamlet, Monells is nonetheless an extremely charming destination, a tiny village with a big heart. Its star attraction is the glorious Placa de Jaume I, which boasts just one little cafe that puts tables under the arches in the summer months – the perfect spot for a pre-dinner aperitif. Monells is also ideally positioned to explore the nearby Emporda wine region of northern Catalunya, the principle grapes are Grenache and Carignan, the wine potent and strongly flavored. Also, be sure to drive outside of the village, as beyond Monells there are some delightful country roads through the lush forest, dotted with more unspoiled hamlets and Romanesque chapels to explore. 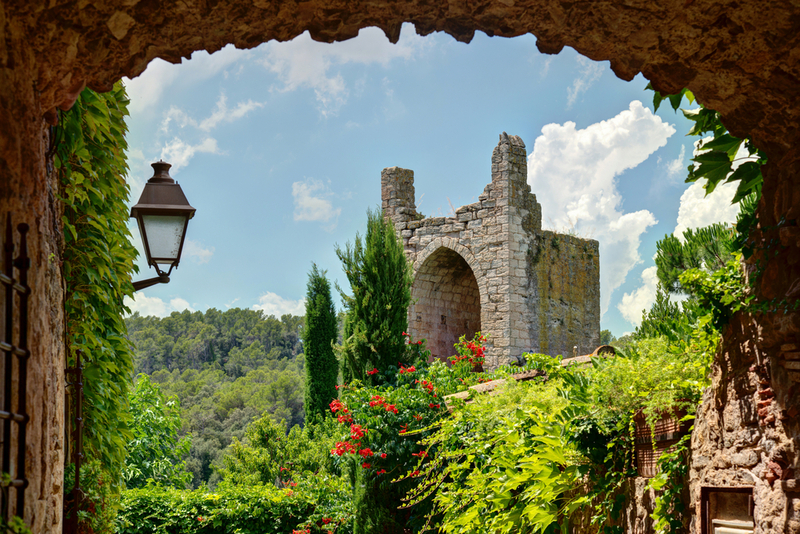 Pals is a touchingly cute village of immediate charm: a chocolate box hideaway that houses a spectacular Romanesque Church with a Gothic interior, multiple little squares and, best of all, is close enough to the rugged Costa Brava to afford day excursions to the seaside. Its main monument is the 15 Torres de les Hores (Clocktower) built between the 11th and 13th centuries. The village dates back to at least the 4th century – the real reason to come here though is to simply wander around the uneven lanes and explore all the medieval nooks and crannies of this fascinating village. From the Mirador del Pedro, you can see across the coastal plains to the sea. There are also a few good restaurants dotted around; wine-wise, you once again find yourself in the Emporda region, home of sturdy, strongly flavored reds. 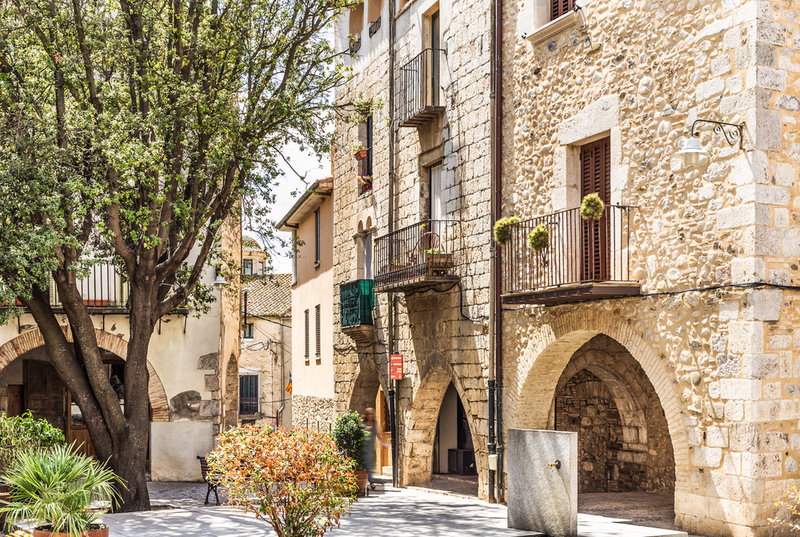 Peratallada attracts hoards of international visitors in the summer, and it’s not difficult to see why. For a start, it achieved considerable fame as being a key filming location for the 1991 Blockbuster movie Robin Hood: Prince of Thieves. It has become a favorite day trip for Catalans as well, lured by the promise of fine restaurants, splendid architecture, a luxury hotel, and many charming cafes, perfect for people watching. The village derives its name from the Catalan for “Carved stone,” a fitting title as Peratallada is full of pretty stone houses. The first settlement dates back to the Bronze Age, although its most important landmark, an imposing castle that has now been turned into a luxury hotel, dates back to the 11th century. Its narrow streets and pretty squares have been supplemented by trendy boutiques and restaurants in recent years, try Can Bonay on the Placa de les Voltes for a slice of traditional Catalan cooking with all the trimmings. Close to the fascinating small city of Figueras, renowned for being the birthplace of Salvador Dali, is the equally beguiling village of Perelada. 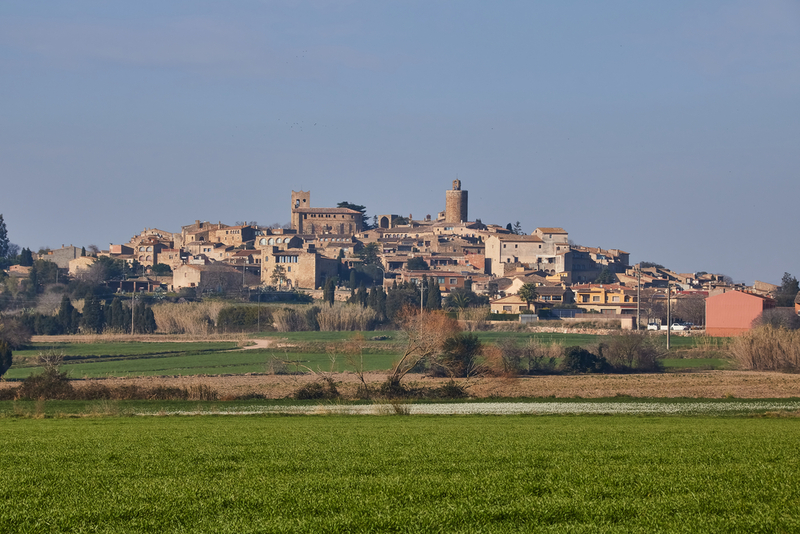 In medieval times, the village was home to the Frankish counts, who controlled this region in Catalunya until it was reclaimed by the Count of Barcelona. Today, it is known above all else for the enchanting 14th century Castillo de Perelada wine estate, who make both premium Cava in Penedes further south and still wines in the region of Emporda. They control over 2,000 hectares on the Costa Brava, making a range of delicious wines including a rose, and a top cuvee called Finca Garbet. Another important landmark is the Castell-Palau dels Rocaberti, built in the 16th century and altered over the succeeding centuries. The castle, with its round towers, has a rather French air and boasts an excellent restaurant, in addition to a Casino! But, the rest of the village merits a leisurely tour, with several medieval churches and convents and pleasantly winding lanes. 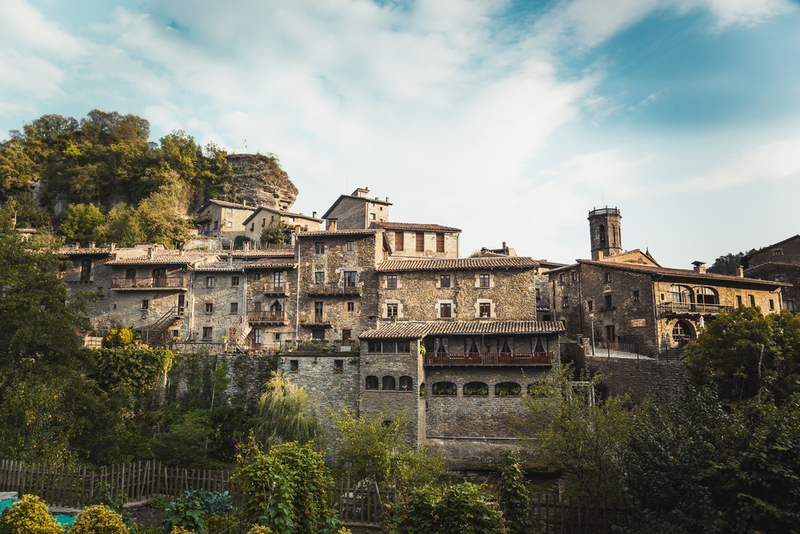 Nestled deep in the spectacular Pyrenees region of Catalunya, you’ll encounter Rupit, a splendid old village set amid rugged countryside – the mountains are a sight to behold. Of course, such majesty attracts plenty of appreciative visitors, who come in their droves to cross the legendary suspension bridge – constructed in the 1940s – that grants access to the village. Inside, you’ll discover plenty of quaint old 17th-century houses, a baroque church, and tucked-away squares. Make sure to wander along Carrer del Fossar, which climbs the hill along the spine of the village towards the highest point. Those with ravenous appetites won’t find many great dining options in Rupit, however, the town of Vic is not far away and boasts a good selection of restaurants – try Art de Coch on Carrer de Sant Miquel dels Sants. They offer a good range of wines from across Catalunya into the bargain. One of the lesser known villages of the Catalan Pyrenees, Santa Pau nonetheless merits a closer inspection. It is situated right in the middle of the Parc Natural de la Zona Volcanica de La Garrotxa, a spectacular national park of lush vegetation and unusual beauty. Volcanic eruptions took place here about 350,000 years ago – the most recent was about 11,500 years and today there are about 30 volcanic cones in the park which stretch up to 160m high. The village itself is quite charming, very small but perched picturesquely on a rocky outcrop, containing a lovely square, the Romanesque church Santa Maria and an ancient baronial castle. Moreover, the upside of its lack of fame is that even in the high summer season the number of other visitors is manageable – bliss indeed! One of our favorite Catalan villages, Scala Dei is something of a Mecca for wine lovers, situated in the Priorat region, famous for its powerful – and expensive! – old vine Grenache wines. Priorat’s steep, terraced vineyards are renowned for their unique soils, known as Llicorella, the soils are very infertile and posses a high quartz and slate content; so in other words, the perfect conditions for growing low yielding, highly concentrated fruit! Scala Dei lies at the foot of the Montsant range, which is also the name of the wine region that almost completely surrounds the Priorat vineyards. Although small, Scala Dei makes for a fascinating day excursion, with its pretty Romanesque church, medieval place and the famous wine producer of the same name, now owned by Cava house Codorniu. But, the greatest architectural triumph is the Cartoixa convent, located just outside the village. Its Basilica, made of red sandstone is stunning, as are the monks’ former residences. 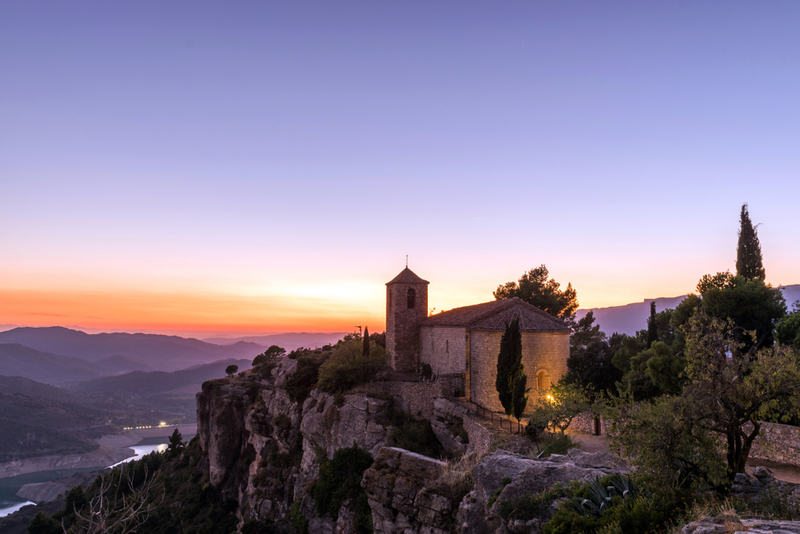 If you want stunning views, then you came to the right place; Siurana is located on a rocky escarpment, offering breathtaking vistas of the Prades Mountains and surrounding valley floor. The hamlet boasts quite a history, the castle of Siurana was one of the two last Muslim bastions to fall to the reconquering Christians in Catalunya. Today it lies in ruins above this pretty, microscopic village inhabited by just a few people. Hikers will particularly love Siurana as walking trails depart in several directions from the village, affording you the chance to appreciate the stunning landscape by yourself. 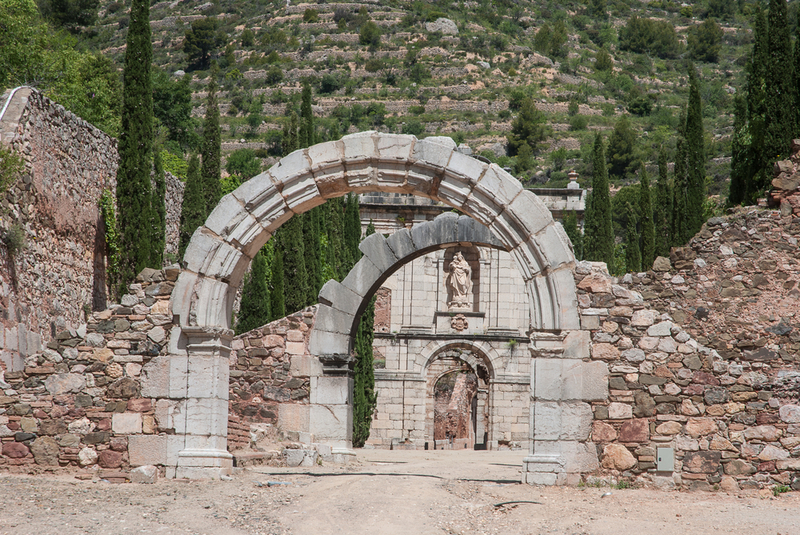 The local wine, Priorat, will be available on tap, for some tasty local dishes we’d head to the nearby village of Cornudella de Montsant, about 9Km away. Ok, so Girona isn’t by any stretch of the imagination a village, but it still merits inclusion for its beautiful architecture and important Jewish heritage. 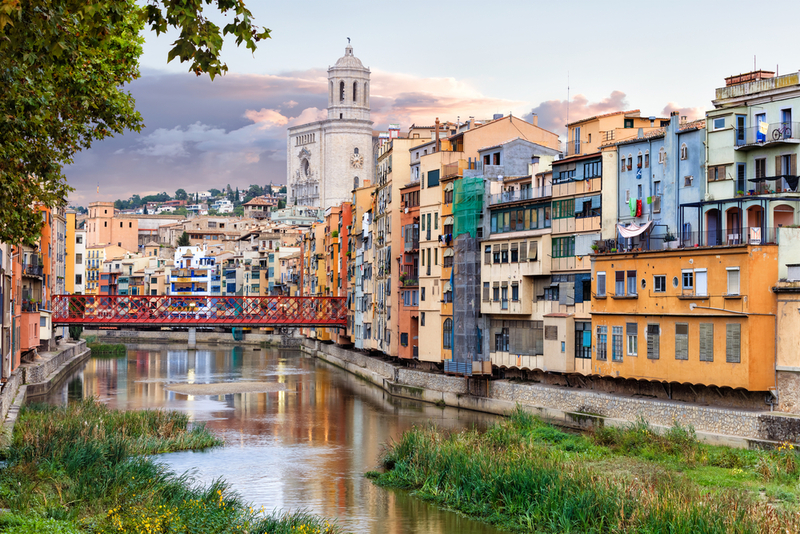 Northern Catalunya’s largest city, Girona boasts an impressive medieval center, which climbs a hill above the river Onyar, and is well worth a visit. Indeed, visitors can often lose track of time in the narrow streets of the old town, before finally arriving at the fine Baroque cathedral, which actually has Europe’s widest Gothic nave. However, the city is most famous for its perfectly preserved Jewish quarter, known as the Call, on the Carrer de la Forca. Until 1492, Girona was home to one of Catalunya’s largest medieval Jewish communities; the splendid Museu d’Historia dels Jueus de Girona provides a fascinating tour of medieval Jewish life and culture. After your cultural exploration, head to one of the cafes under the arcades on Rambla de la Llibertat, it’s a great place to soak up a bit of atmosphere and sip Cava. And when your mood turns to dinner, we’d recommend Boira, on Placa de la Independencia. Delicious Catalan classics, friendly service, and a keenly priced, varied wine list – what more could you ask for?